Professor Krishna Nath, who was born in 1934 passed away a couple of weeks ago whilst staying with friends at the Valley School in Bangalore. Born into a family of freedom fighters who opposed British rule in India, Krishna Nath continued a heritage of dissent and protest throughout his life, often adopting the cause of Dalit and Tribal peoples who were oppressed and denied basic human rights. As a Satyagrahi he went to prison on thirteen occasions having taken non-violent action on behalf of people who had been subjected to demeaning actions by various authorities. By organising the occupation of Hindu temples by members of the disgracefully labelled “untouchable” castes, thus challenging the authority of a conservative and extreme leadership of that faith, he placed himself in direct opposition to powerful forces and paid the price with periods of incarceration. His actions attracted a number of critics and bitter opponents, but also won great respect from more liberally minded Indians and a wide range of politicians and intellectuals. As a young man, Krishna Nath was politically active with the Samajwadi movement, campaigning on issues of social justice and equality, and deeply opposed to the dynastic politics of Congress and the inward looking approach of the Bharatiya Janata Party. Having seen the dawning of Indian independence in 1947, like many other idealists at the time, he quickly became disillusioned by the inability of successive Indian governments to provide greater stability and opportunity in the lives of the country’s poorer people. It was not only for his work as a social activist that Krishna Nath was held in high esteem. Having spent much of his life studying the culture and traditions of the peoples of the Himalaya regions, he was regarded as one of the leading authorities in this area, and wrote a number of scholarly works that have informed an understanding of the region and its people. The World Buddhist Conference recently honoured him for his contribution towards Buddhist thought and culture. Sadly, very little of this work has been translated into English, though it is to be hoped that a suitable scholar might be found to undertake work that would be invaluable to those who would wish to understand more of the culture and history of this little known region. Perhaps the University of Varanasi, with which he was associated over many years may take on the responsibility of ensuring that his seminal work reaches a broader audience. I was fortunate enough to engage in conversation with Krishna Nath on a few occasions when my visits to the verdant lands of the Valley School near Bangalore coincided with his. Listening to his profound thoughts on Gandhism, the state of Indian politics, the plight of Tibetan Buddhists and Buddhism, or on many aspects of Himalayan art, music or languages, one was soon aware of being in the presence of a true intellectual who had made an immense contribution to the life of his country. Amongst all of this, his apparent simplicity and humility stood out as a characteristic of a man who was more interested in his listener than in hearing his own voice. I knew exactly what he meant and was grateful when we reached our destination in one piece. On another occasion, leaving the dining hall at the Valley school, I was unable to locate my sandals that had been left outside the door prior to entry. Just as I was about to accuse the local monkey population of yet another theft, I heard Krishna Nath exclaiming that his feet had most certainly swollen as his sandals felt extremely tight! Gazing at his predicament I was soon able to solve the problem by locating his footwear and relieving him of my own. I could have wished to have spent more time with a man who was a great scholar, and a tireless fighter of injustice and oppression. Listening to him speak I was acutely aware that every word he used was carefully measured and his statements weighed and considered before he proffered an opinion. His life was an example and an inspiration to all who came into contact with him. The Dalai Lama, and numerous Asian intellectuals considered Krishna Nath to be a friend and sound counsellor, and many have good cause to be thankful for his tireless campaigning on their behalf. The memories of the few occasions when I was able to sit and listen to him, are ones that I treasure, and I count myself fortunate to have known him. I remember many years ago I read Coretta Scott King’s account of life with her husband, Martin Luther King Junior. I recall at the time thinking how hard it must have been, living as a wife and mother to the children of a man who was constantly living under death threats and intimidation. As a man of principle and conviction, King led a non-violent movement fighting against injustice and seeking to secure a better future for an oppressed people, who looked to him to stand up against the racist cowards and bullies, wielding power in the southern states of the USA. Whilst leading the civil rights movement and campaigning for the freedom of black people and other oppressed minorities in America, King committed himself and his followers to non-violent direct action. But as had earlier been the case in a similar approach adopted in India by Gandhi, he and his fellow protesters were often confronted by opponents who saw physical force rather than debate as the means of stating their position. “Everybody can be great…because anybody can serve”. Last night Sara and I visited a local cinema to see the film Selma, released this week in the UK. This powerful drama tells the story of the marches led by Martin Luther King Junior from Selma to the Alabama state capital Montgomery in 1965. At times I found myself struggling to watch this vivid depiction of the events of those dark days in American history, as scenes were enacted in which unarmed men, women and children were attacked, wounded and in some instances killed by men who regarded themselves as law abiding citizens of the southern states. The film’s director, Ava DuVernay, cannot be accused of over emphasising the level of violence for effect, but still I found myself wanting to turn away from the screen as the appalling assaults were so vividly portrayed. The film has masterful performances from all the cast, but particularly from David Oyelowo who plays King, Carmen Ejogo his wife Coretta, Tom Wilkinson as President Lyndon B. Johnson and Tim Roth as the bigoted and somewhat sinister Governor George Wallace, and as with all good films of this nature I found myself immersed in the story line and emotionally drawn in right from the start. Even knowing of the historical events depicted and having read the accounts of the marches as reported by writers such as Clayborne Carson who was close to the King family, I was unable to relax for more than a few moments at a time throughout the film. Whilst I suspect many other film goers from my own generation will be very well aware of the civil rights struggles led by Martin Luther King Junior, there may well be a younger audience for whom the horrors of this time, perpetrated in a country proud of its constitution and democratic values, will be a source of shock and disbelief. I certainly hope so, because to simply write this off as a historical account would be to fail to appreciate the important messages within the film. Two specific themes within this drama seem to me to have been particularly well addressed and might easily have been passed over in a more superficial telling of the story. The first concerned the personal anxieties and doubts of Coretta Scott King, as she feared for the life of her husband and family, and the tensions she experienced in balancing what she saw as her duty to a cause and these more personal responsibilities. Within the depiction of this complex and loyal woman, superbly portrayed by Carmen Ejogo, there was a perpetual nervous frisson that penetrated the film, and conveyed the message that within any struggle for justice, personal sacrifices are inevitable. Sadly, the worst fears of Coretta Scott King were eventually realised in April 1968 when her husband was assassinated at the Lorraine Motel in Memphis, Tennessee at the age of 39 years. I can’t help thinking that whilst this film is set within an historical context, the messages that it contains are as important today as they have ever been. The film link below will enable you to hear the famous “I have a dream.” speech delivered by Martin Luther King Junior in front of the Lincoln Memorial in Washington DC. 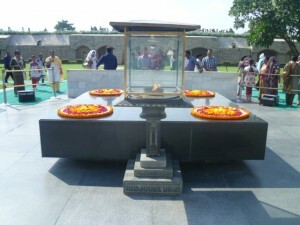 Raj Ghat Samadhi the memorial in Delhi that marks the spot of Mahatma Gandhi’s cremation. A moving place where respectful crowds stand in silence. January 30th this year marked the 67th anniversary of the assassination of Mahatma Gandhi by the Hindu fundamentalist Nathuram Godse, as he walked from Birla House in Delhi to conduct a prayer meeting. This savage act plunged a nation into mourning and is commemorated today by supporters of Gandhi’s stance on non-violence and social activism across India and the wider world. As is usual, the date provoked comments on Gandhi’s legacy in several Indian papers this year, and my attention was particularly drawn to one in the Hindu, written by Varghese K. George under the heading Gita, Gandhi and Godse (Hindu Jan 30th 2015). The article is interesting for constructing an argument that both Gandhi and Godse had been opposed to British rule in India. They had also shared the same Hindu faith and were profoundly influenced by the contents of the Bhagavad Gita, which was written at some point between 400 BCE and 400 CE. In his article, George stresses the point that many great leaders and campaigners, including Gandhi, and Martin Luther King junior, and he might equally have added Aung San Suu Kyi, have been driven by a religious conviction that shaped their view of the world, and in particular their beliefs in both social justice and the means by which this might be achieved. 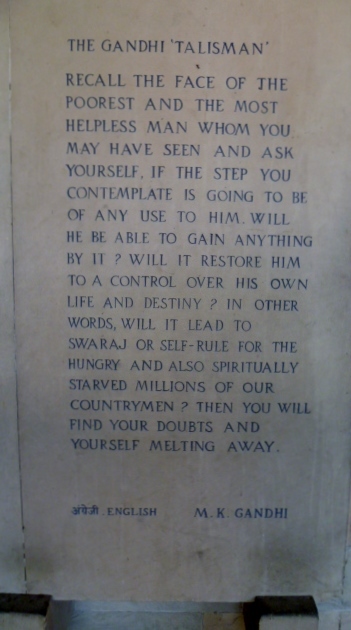 He then goes on to discuss the fact that Godse whilst profoundly influenced by the words of the Bhagavad Gita, gave this text an interpretation that was so far removed from that of Gandhi’s that he became a murderer, whilst Gandhi died a martyr. George makes a very articulate and well-reasoned case within his article for a debate about the place of religious doctrine in the politics of today’s largely secular societies. He points out that the current Indian Prime Minister Narendra Modi, has been very pointed in his presentation of copies of the Gita to a number of world leaders, including President Barak Obama, and the Japanese Emperor Akihito. This he suggests, may well have angered some of the Indian population in what has been firmly established by the 1950 constitution as a secular state. India is in fact home to representatives of all the world’s major religions, and it has been argued that the secular nature of the state has been an important factor in the retention of social accord since independence in 1947. This is certainly an interesting debate, but reading this from a teacher’s perspective, of even greater interest is the discussion within this article of the interpretation of religious texts and the ways in which these are conveyed to others. Gandhi’s reading of the Gita was undoubtedly influenced by his contact with other religious texts, including the Christian Bible and the Moslem Quran, both of which he found to have passages that greatly moved him. 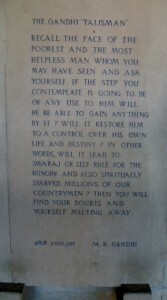 Writing in From Yeravanda Mandir, Gandhi stated that in his opinion “All faiths constitute a revelation of Truth, but all are imperfect and liable to error.” However, he also believed that these great religious texts called upon adherents to their faith to treat all men with respect and to abhor violence. Gandhi’s interpretation clearly did not sit well with Nathurum Godse and his colleagues, who chose to justify their appalling actions through reference to religion. It was in part, Gandhi’s respect for the rights of India’s Moslem’s to assert their opinions and choices that so incensed Godse and many others of similar extreme views. As a result of this a terrible crime was committed and both men lost their lives. 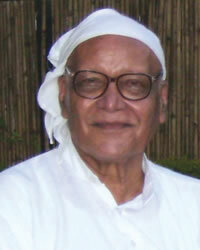 Within his article, Varghese K. George makes the important point, that whilst leaders such as Gandhi and Martin Luther King junior have used religious books to justify their non-violence, so have many despots of the past used the same texts to support their actions of mass killing through crusades, Jihad and “holy wars” against those who hold a different set of beliefs. As George emphasises at the conclusion of his piece, it is all about our reading of the text rather than simply the words contained on the page. The Hindu article struck a chord with me as I was leaving Bangalore, having over the past two weeks enjoyed the company of Hindus, Christians, Moslems, Buddhists, Jains, Sikhs and secularists all working together in various situations. At no time did I feel greatly distanced from these individuals, or the views that shape the ways in which they behave, despite not personally subscribing to their religious beliefs. Yet I read increasingly in the media and hear repeatedly on the radio that men are killing each other and inflicting their distorted view of the world and are justifying this mayhem by reference to scripture. Such behaviour is an affront to education which surely must have as a major aim the promotion of respect and tolerance. Those who are most directly involved in acts of violence are for the most part not educated men, and those who lead them choose to use their own education as a means of controlling others for their personal ends rather than working towards a better society for all. As teachers there must be an imperative upon us to assist children to interpret religion as providing a set of guiding principles aimed at creating a more just and caring society. If we do not believe that religion has a part to play in challenging violence and aggression, then it should have no place in our schools. Nathuram Godse and his co-conspirator Narayan Apte were both hanged on November 15th 1949 for their part in the assassination of Mahatma Gandhi. I am quite sure that the decision to execute these two men would have been opposed by Gandhi, who would have seen violence as playing no part in the implementation of justice. Where these students lead, may others follow. 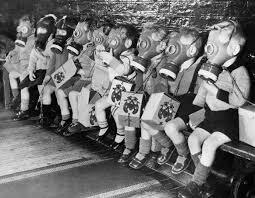 Students setting an example from which others could certainly learn. Shweta, who is one of my student colleagues in Bangalore yesterday sent me an interesting series of photographs from the school where she works. One of the teachers at this school had been teaching her class about environmental issues and how these relate to hygiene and health. As with all good teachers she thought about how she could take the ideas discussed in class and enable her students to apply them in a practical manner. Deciding to take a lead from the students, she asked them to decide how they might apply the principles of improving their environment and creating a more healthy area in which to live and work. Just as we might expect from a class of bright and enthusiastic students, they were full of ideas and suggestions. These included planting trees, cleaning the school building, and eventually the idea upon which they settled; cleaning up the litter from around the school. 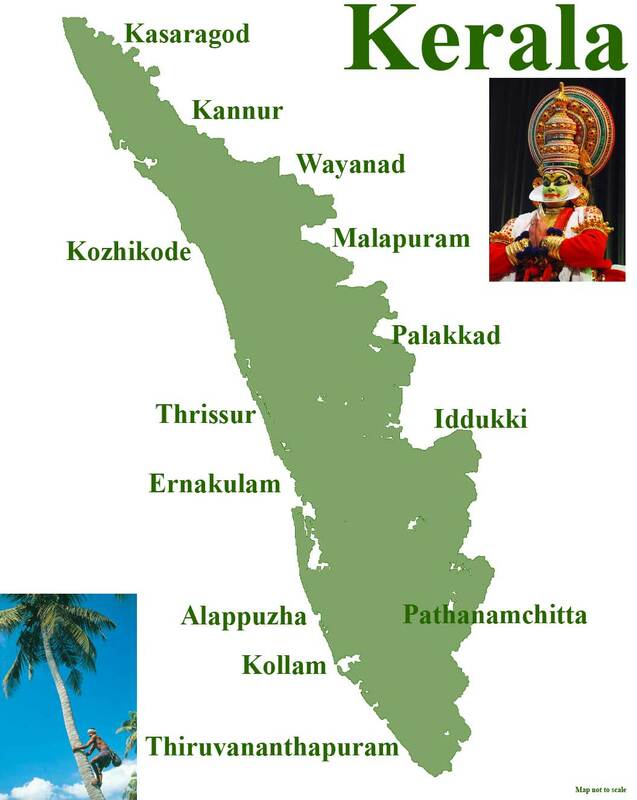 My friends in India know that I have a real passion for their country, its culture, history, literature and the people. 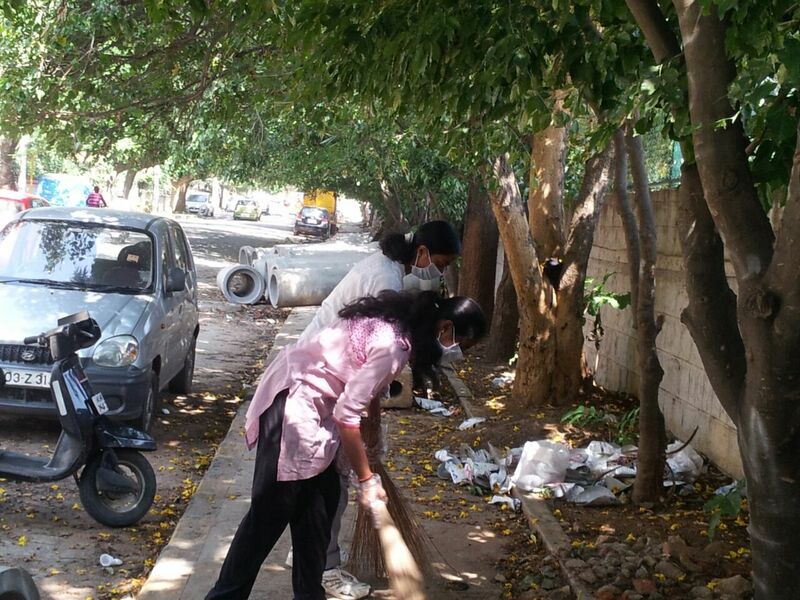 However, many of them are also aware that I am less than enamoured with the vast quantities of litter that are a blight upon the streets and parks of every Indian city. I am sure that many visitors to the country rarely see beyond the piles of plastic, paper, textiles and other detritus that foul almost every street corner of an otherwise beautiful city. Soon after his election and appointment as Prime Minister of India, Mr Narendra Modi, broom in hand launched a campaign for a cleaner India. His own efforts in sweeping the streets were most certainly more symbolic than active, but at least he was making a point that there is an urgent need for Indian citizens to take some responsibility for cleaning up their environment. “I had a personal talk with her and made her understand that there is nothing undignified about cleaning your surroundings; in fact you are setting a very good example to many people who fail to understand the importance of cleanliness”. I can imagine that this was not the easiest of conversations, but after seeing the teacher’s perspective, and appreciating the response from the rest of the class, the reluctant student decided that she would join the rest of the class in this activity. As the photographs show, the students went about their task with enthusiasm and by the end of the day they were rightly proud of what they had achieved in a relatively short time. This story reported to me by Shweta and her colleagues had a particular resonance as I recalled a chapter from the autobiography of Mahatma Gandhi, The Story of my Experiments with Truth, in which he described how during his time in South Africa he had argued with his wife Kasturba. Wishing to set an example and to demonstrate his opposition to the caste system, Gandhi insisted that everyone, including himself, should be responsible for undertaking all of the duties around the community that he had established. This involved as a priority maintaining a hygienic environment and included the cleaning of latrines. Having set an example by completing this task himself, he expected his wife to follow suit. At first she refused and this annoyed Gandhi who raised his voice in anger, an act that caused him to record the shame that he felt for having lost his temper. After some discussion and much forgiveness, Kasturba agreed that she too should participate in this most menial of tasks, and recognised that for the sake of a community everyone must accept the responsibility to play a full part in caring for the environment. The maintenance of a healthy and clean environment should not be seen as beneath the dignity of anyone, and neither should it be seen as the responsibility of others. This specific incident is depicted very well in Richard Attenborough’s film of the life of Gandhi. 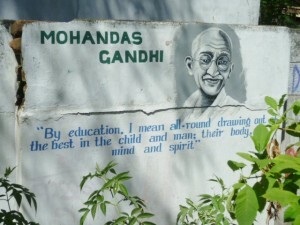 It may seem like a large conceptual leap from the life of the Mahatma to a small school in Bangalore. But I think we should take heart from the fact that the students at this particular school are taking a lead in appreciating that they have a responsibility to the environment in which they live. Furthermore, they have shown a willingness to take action in order to improve the grounds in the immediate vicinity of their school. 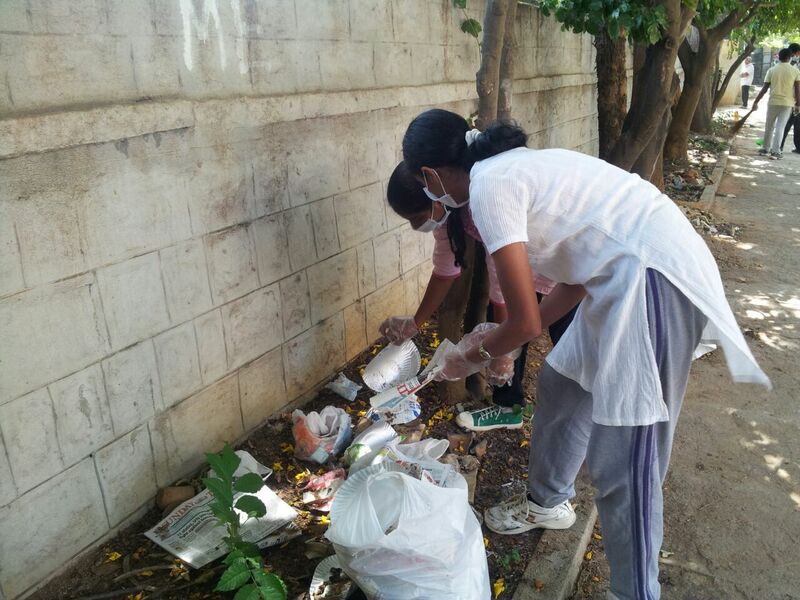 It would be easy to say that this action is but a drop in the ocean, and can have only a limited impact upon what must be the many thousands of tons of rubbish that pollute the Garden City of Bangalore. 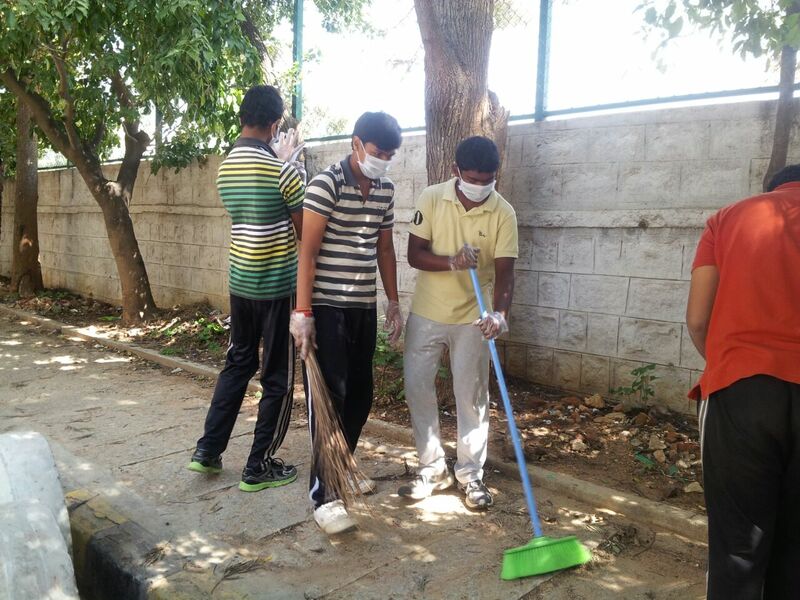 But if each individual resident took responsibility to manage their own litter and clean their own area of the city, thereby following the example of these young people, it would not be too long before the Bangalore environment was significantly improved. 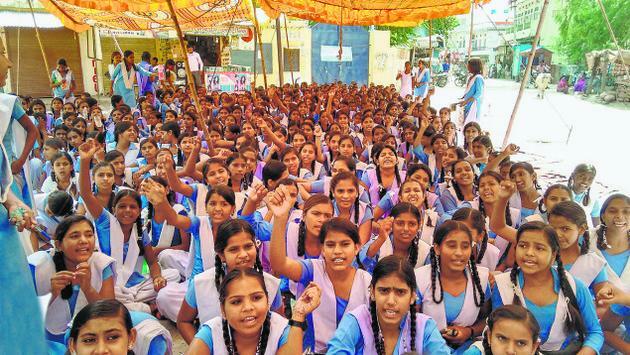 The apprehensions expressed by one student within the class are not so far removed from those experienced by Kasturba Gandhi, and hopefully, like the mother of the nation she will have learned much by thinking through this situation, and may make a similar contribution to the welfare of India in the future. 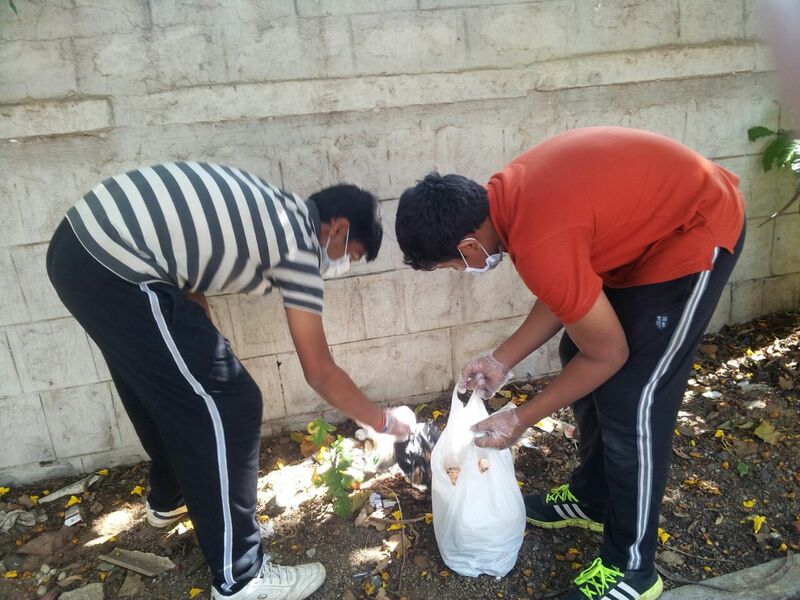 So, today I wish to celebrate the actions of a small group of students and their teachers, who far from waiting for others to bring about change, have taken the initiative to do something positive for their neighbourhood. 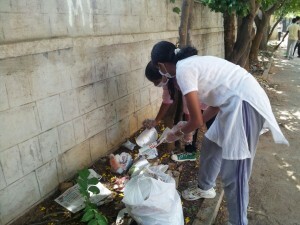 If these young people are representative of the students of Bangalore, there must be hopes for a healthier future in the city. Pause for thought. Tavistock Square in the rain. I was in London yesterday to attend a meeting and was pleased to find that this was to be held in Russell Square. This is one of several green enclosed spaces in the Bloomsbury district that provides some level of respite from the hurly burly of London traffic. In order to get to the meeting venue my walk took me from the recently modernised St Pancras Station along Euston Road and then through Tavistock Square my favourite of the series of green squares that stretch between Euston and Holborn. If you are ever in this area and have time to idle for a while it is well worth exploring this bijou space. 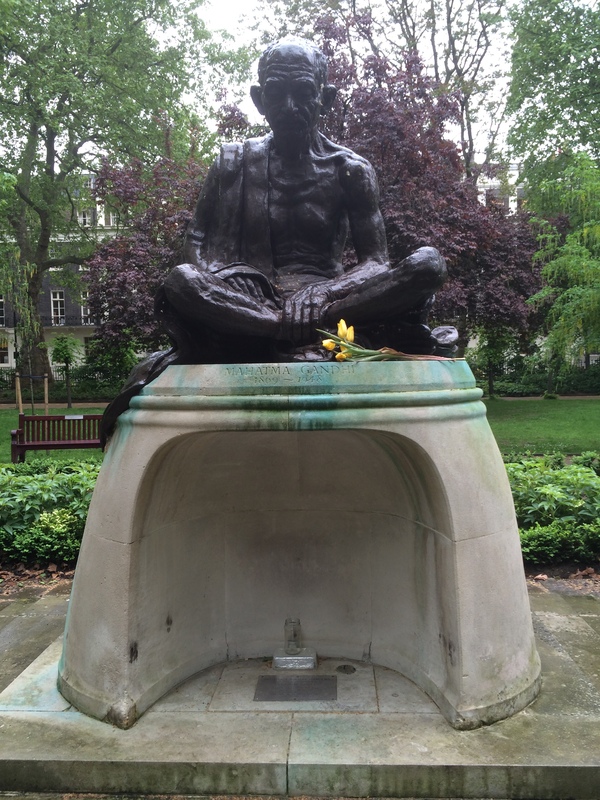 Tavistock square is dedicated to champions of peace and those who have campaigned at various levels for human rights. Within the square there is a tree planted to commemorate the victims of the dropping of an atomic bomb on Hiroshima and nearby a rock adorned with a plaque serving as a tribute to the lives of conscientious objectors to war and as a reminder of many of the atrocities of the twentieth century. The first Prime Minister of an independent India, Jawaharlal Nehru came here to plant a copper beech tree and other leaders have visited to pay homage to the victims of war and oppression. Tavistock Square has been the focus of many meetings of organisations committed to working for peace and human rights over the years. Throughout the square there are benches labelled with small brass plaques, many with inscriptions to individuals for whom the tranquillity of this place had some significance, and elsewhere trees have been planted in the memory of loved ones who made a significant contribution to their community, for example Sir John Barbirolli, the composer and the author Virginia Woolf. There is one statue, created by an artist named Freda Brilliant, that takes centre stage in Tavistock square and is probably more visited than all others. Unveiled in 1968 by the then British Prime Minister Harold Wilson the statue of Mahatma Gandhi has become a focal point for visitors to this part of London who have campaigned for peace and human rights. I must have stood before this statue many dozens of times over the years, just as I did yesterday in pouring rain, huddled beneath my umbrella, pondering on the contribution that this unique man made to the history not only of his country, but to the lives of many around the world. In particular whilst the water dripped from my umbrella yesterday, I thought of some of the articles I have been reading lately in the UK media that have encouraged an increasing negative view of education and others that have seen this as a contested area, sometimes praising teachers for their care and professionalism, whilst on other occasions blaming them for many of society’s ills. 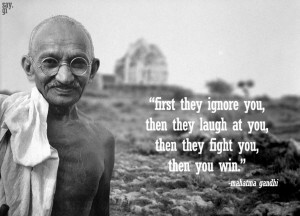 Gandhi believed in a largely Platonic view of education based upon the notion of developing human values and virtues. Writing in his book The Philosophy of Gandhi, the theologian Glyn Richards said of the Mahatma, “he saw that one of the ways in which basic human rights could be restored was by the provision of equal opportunity in the field of education”. During his life time Gandhi experimented as a teacher, with varying degrees of success, whilst attempting to educate his own children and those of others in the communities that he founded, including Phoenix in South Africa. In his autobiography he wrote of the difficulties he experienced in a teaching role and was candid about his failure to always connect as he would wish with his pupils. However, throughout his life he campaigned for the adoption of compulsory education and for the education of women. He advocated a focus upon vocational training and stressed that respect for manual labour should be an important component of any education system. Whilst he emphasised the importance of improving the literacy levels within his own country he wrote that “Literary training by itself adds not an inch to one’s moral height, and character-building is independent of literary training.” Indeed he believed that illiteracy should be far less of a concern than what he termed character deficiency. Knowledge he believed to be important but the application of learning for the benefit of others was far more dependent upon children learning concepts associated with justice, duty and service. When reading Gandhi’s ideas on education today some aspects of his thinking appear to be out of touch with developments in the twenty first century. In many quarters he is viewed as too idealistic to have relevance to the modern world. I would though contend that the underlying principles of his educational philosophy contain a strong message that resonates with many teachers who now find themselves striving to move beyond teaching as a mechanical and technocratic process. 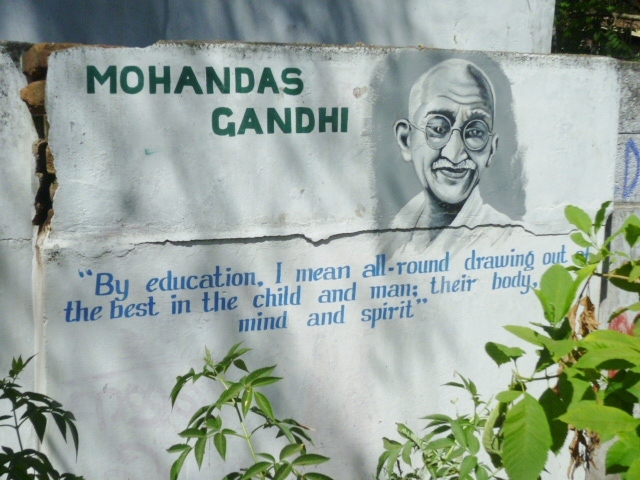 Education for Gandhi was about enabling individuals to become independent critical thinkers who based their actions upon social justice and used knowledge to benefit their communities. 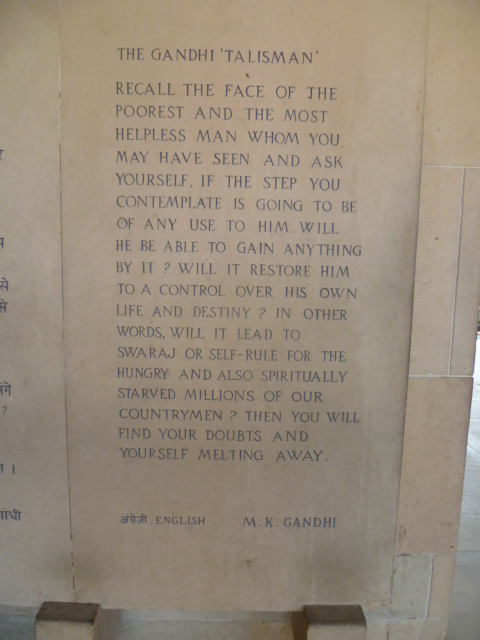 Whilst I know that even amongst many of my friends in India there are misgivings about some of Gandhi’s ideas, it does seem to me that the tenor of his beliefs provide at the very least an important starting point for debates about education and the ways in which we live. Should you be in the vicinity of Tavistock square in the future perhaps you too may pause by this statue to consider the ideas of a man who attempted to live by a philosophy of service to others.